I’m a philosopher and one thing that philosophers do is conceptual housecleaning. We tidy up ideas and arguments. Today I want to talk about are four different ideas that people often confuse with one another. It’s messy. First, fat people can be successful at athletics. See The Shape of an Athlete. Likeswise, Plus sized endurance athletes, we exist! and Big Fit Girl. Second, fat people can be fit. See Fat, Fit, and What’s Wrong with BMI. Third, fat people can be healthy. See Healthism, Fitness and the Politics of Respectability. But just because fat people can be all these things doesn’t mean they are the same thing. We need to separate athletic performance from fitness and health, because not all bodies that do well at a particular sport are fit or healthy. When you train for maximizing your performance in one area, you may do it in ways that harm other aspects of overall fitness. You might also do it in ways that compromise your health. What matters most is doing well in a given sport. Fitness and health may or may not follow from that training package. But all of this is separate from the idea that all bodies are worthy of respect, whether fit or not, thin or not, able or not, healthy or not. Far too often we run together the idea of moral virtue with the idea of physical health. And when I say that fat people can be fit, I’m not saying that only fit bodies are worthy of respect. 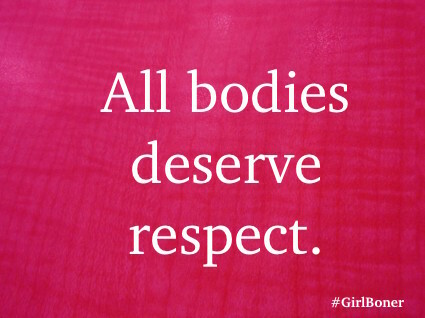 Repeat after me, all bodies are deserving of respect. Just because we’re writing about fitness and about athletic performance it doesn’t mean that we only care about and respect people who also care about fitness and sports.